Step 1 For the chicken burgers, combine all ingredients in a bowl and roll into burger size patties. Add patties to an oiled pan over a medium heat; cook on each side for approximately 5 minutes or until golden brown. Step 2 Meanwhile, to make the slaw, thinly slice all ingredients into batons and mix through kewpie mayonnaise. 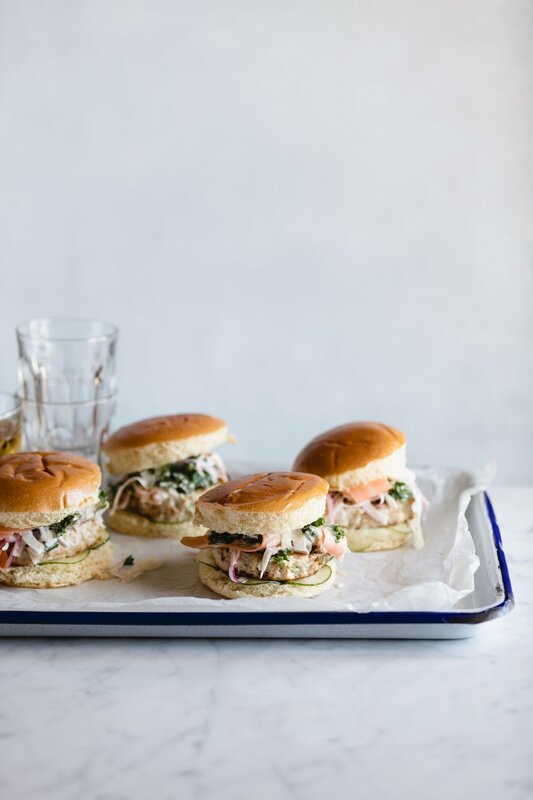 To serve, start by placing a patty on the bottom half of each brioche roll, place pickled cucumber slices on top, followed by the slaw. Drizzle kewpie mayonnaise over the top of each bun and place on top of the slaw.